Since the announcement of Frankenstein, we've been talking to a lot of people about the possibilities and potential of adaptive, interactive stories. A lot of people are excited. Others say, so, isn't it just a gamebook? It's true, our stories contain choices, and the choices you make change the story that you read. That does sound a bit like a gamebook, doesn't it? But I think there are some crucial differences. Not just simple things, like because it's on an iPad or an iPhone you don't have to turn the pages yourself. Not just that we won't be using dice-rolls to decide if you're allowed to continue the story. But there's something fundamentally different to exploring a book of choices, and an app that uses your choices to weave a story around you as you read. But before I talk about gamebooks, I want to talk about mazes. And in the end, most of us are pretty good at not getting lost. Everyone can find their way around the streets of their home town. Very few people will walk around in circles over and over without realising. 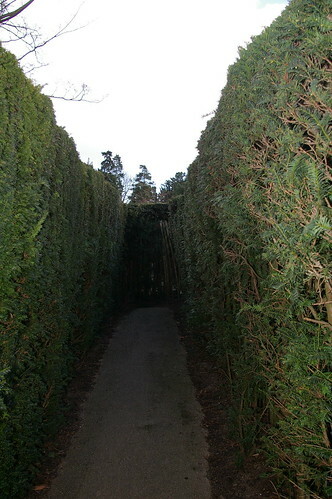 In a hedge maze, we start to recognise the hedges, the views glimpsed through gaps in the leaves. We know how to orient ourselves. 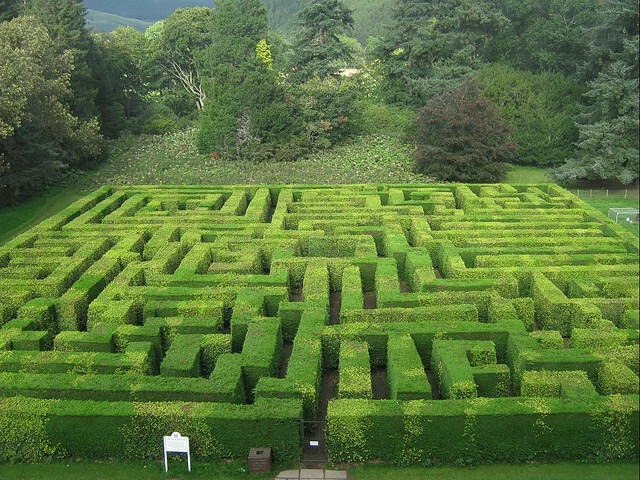 So hedge mazes are usually quite difficult. No-one walks straight through them first time. Everyone hits a few deads ends, walks a few times in a circle, before they reach the centre. ...but then they have a team of artists and designers whose job it is to telegraph every opening or way forward as clearly as possible to the player. In Uncharted, if you're supposed to jump on a ledge, they'll perch a bird there, who takes off as you approach. 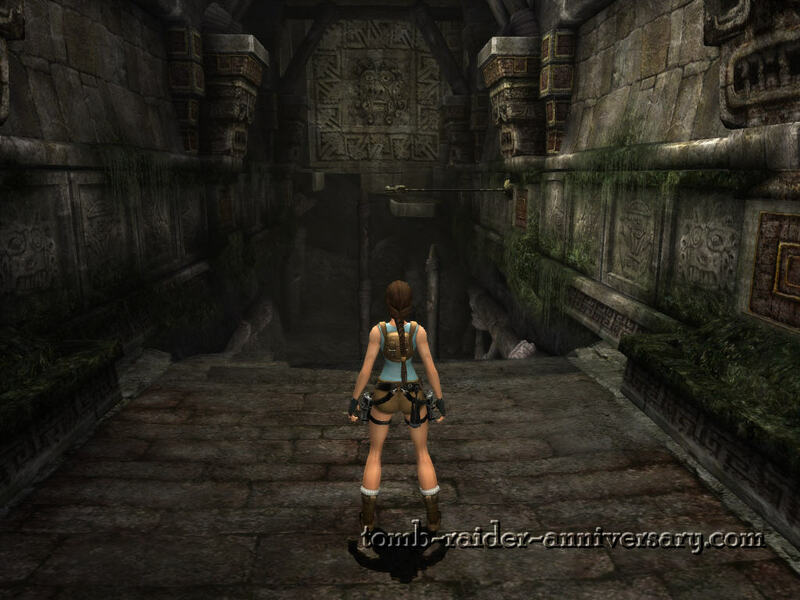 In Tomb Raider they go one step further and colour things you can climb on in a not-very-tomblike beige. In Batman they offer several routes, but they all link up and go one way, and anyway, they give you a map. These guys do a good job. Almost every player walks straight through the twisting, turning world without getting stuck. And if, in user-testing, a player doesn't know immediately which way is forward, then it gets reported as a bug. This isn't dumbing down. It's not that Henry VIII liked a pluckier challenge than today's gamers. It's because digital worlds offer no points of reference. They confuse our sense of direction. In fact, they're almost impossible to navigate: in a 3D game, it's perfectly simple to get lost in a circular room with nothing in it, and forget which door was the one you came in by. The physical experience of "solving" a maze by walking through it changes completely once it's put into a game. It becomes much more an experience about looking than moving: one that's a lot more like the tour through the numbered, roped-off rooms inside Hampton Court than the hedge maze in its gardens. Not because game designers want their games to be easy: but because they want them to be enjoyable. Gamebooks are physical problems, like hedge mazes. They tended to be hard. The authors wanted you to get lost in them. They wanted you to read forwards, backtracks, go a different way, cheat. Solving a gamebook was like completing a jigsaw or doing a Sudoku. You might call it a "tidying up" problem: all the bits of the problem are right in front of you; you just have to work out where they go. Frankenstein is not a gamebook. It's not a problem to be solved. There are no dead-ends to be unravelled. You can go back and make different choices if you want to, but you don't have to. You don't need to master the book to be rewarded by it. Your goal as a reader isn't to solve Frankenstein's problems, but to experience them alongside him. Tour his lab, live through his highs and lows, understand his world and his monster as he does. Digital adaptive fiction requires a completely different design from a gamebook: one that moves away from challenge towards consequence; away from a focus on the paths you didn't take and towards the paths you did. We don't want readers to "master" our inklebooks: we want readers to nurture them. The stories they contain are precious, fragile things, that like any good story might turn at any moment. But having choices means you will be right there when they do. And that's exciting.